As I write this article, it is September—National Alzheimer’s Disease Month—and only one month before the new Health Exchanges under Obamacare. Women with a family history of ovarian or breast cancer should read this article very carefully. Genetic testing is being discussed more and more and many doctors are confused as to how it fits into responsible patient care. Some people even claim that testing has not been proven to save lives. It is absolutely important to know if you have the BRCA1 or BRCA2 gene. These cancer genes could quadruple your chance of getting cancer. This is particularly important if you have any first degree relatives with breast or ovarian cancer. If you have several second degree relatives with breast or ovarian cancer, then you should have testing. Why test? 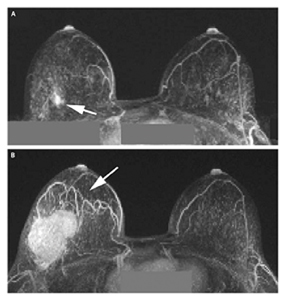 The picture here shows a Worst Case Scenario: A woman with the BRCA1 gene who presented with a 7mm mass … which grew into a 7 cm mass in just one year. WOW! This shows you how important it is to know if you have the BRCA1 or 2 gene. MRI Consultants offers genetic testing for the BRCA1 gene or BRCA2 gene. Rather than having to have a lengthy and expensive consultation with the genetics department of a hospital, we simply gather your genetic sample (cells from your mouth) and send it to a national genetic testing facility. While we do this for free, a referral from your Primary Care Physician is required. The patient fills out a short medical history form and insurance questionnaire, and the lab agrees to contact your insurance company to see if the test is covered, and, if so, what cost is passed on to the patient. You are notified of the cost before any work is done, and if you decide not to go forward, you are not charged. Under Obamacare, this genetic testing will be covered. Under Obamacare, all sorts of screening tests will be FREE. At present, we are the only MRI facility in Delaware to offer spectroscopy. There are no cons to proton spectroscopy. It uses no ionizing radiation. It provides crucial information that no other imaging test can give and few doctors have even heard of it- unless they are a cancer researcher. 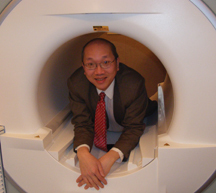 Dr. Chao has done spectroscopy since his fellowship at the University of Pennsylvania when he then brought it to Delaware. It is useful for brain tumors, breast cancer and prostate cancer detection. It can show your tumor in the prostate when your PSA level is going up. It can show if a mass in the breast is cancerous. Without any incisions. Not only does it have no side effects or contraindications, it can also detect Alzheimer’s Disease. Proton spectroscopy is a test available that will not expose you to radiation needlessly. It can provide crucial information even when they think you might have a stroke – which can be misdiagnosed. If your stroke does not follow normal clinical expectations they can ask for spectroscopy of the so-called stroke. Sometimes doctors misdiagnose stroke when you actually have a brain tumor. Having spectroscopy done for free – at our Lewes advanced 32 channel MRI takes 4-5 minutes more scan time and is FREE when your doctor orders a brain scan with and without contrast. Many people—even doctors—are totally unaware that MRI comes in several levels of quality … ranging from “fuzzy” images to ones that are crystal clear. We do body diffusion weighted imaging (“DWI”). In the brain, this technique shows early strokes. In the body, it shows tumors of the GI tract and of the kidneys. We found two pancreatic cancers just last year. We found several patients with liver metastases using this technique. In the past year alone, we diagnosed two kidney tumors based on their appearance on DWI. We offer cutting edge technology tempered with 28 years of experience doing, teaching and inventing MRI techniques. 3T is faster, has more resolution, and it is the MOST detailed and accurate scan available. For more information on this and other MRI-related issues, check our websites: www.mriconsultants.net www.bestopenmri.net. For people who are without insurance, we offer a low Out-of-Pocket discount and for those who are truly claustrophobic, we offer IV sedation. We try to make your MRI experience as low-stress as possible. Next Story → Helping Delaware Hear Better for Over 20 Years!